(SAVANNAH, GA) Healthy Savannah and Enmarket are accepting speaker nominations for the 2019 Enmarket Encourage Health Educational Series, the sixth year for the program that features sessions on nutrition, fitness and tips for living a healthy life. Program topics have covered a wide range of subject matter discussed by respected experts in the health field. Popular themes have included the correlation between heart health and a healthy lifestyle, blue zones, the benefits of a plant-based diet and other similar issues. Anyone who has an idea for a health-oriented educational speech should submit the concept to Paula Kreissler at paula@healthysavannah.org. The deadline is Tuesday, January 15. Applications should include the presenter’s name, title, company and contact information, along with the proposed topic, a description of the speech, sample articles or videos of previous presentations and any supporting materials to demonstrate expertise. Please attach a biography and headshot. All submissions will be reviewed by the Encourage Health advisory board. 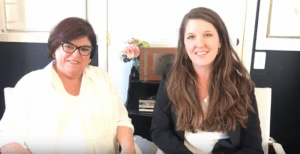 Because the events are non-commercial and center on offering health education to the Savannah community, speakers are asked to volunteer their time and not promote any specific product or service in their presentation. Selected speakers will be announced in March, and the 2019 lunch-and-learn series will kick off on Tuesday, April 30. The other lectures will be held on the following Tuesdays: June 25, August 27 and October 29. For more information, contact Kreissler at paula@healthysavannah.org. (SAVANNAH, GA) The Dewitt Tilton Group prepared and delivered holiday meals to the first responders and staff at the Thunderbolt fire and police departments. 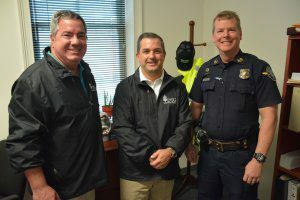 Andrew DeWitt and Chris Tilton, owners of The Dewitt Tilton Group, with Sean Clayton, Thunderbolt Chief of Police. Because first responders are always on the move, the meals were delivered in to-go boxes for easy transportation. Chris Tilton and Andrew Dewitt, principals of The Dewitt Tilton Group, personally packed the boxes and hand-deliver them. Baleigh Youmans, Administrative Assistant; Andrew DeWitt, Co-owner; Chris Tilton, Co-owner; Kim Thomas, Director of Operations. The meals included turkey, stuffing and sides with all of the fixings of a home-cooked meal. Altogether, over 30 first responders and staff members received a meal. (SAVANNAH, GA) The Junior League of Savannah is now accepting applications for Community Projects through December 31, 2018. Community Projects are organizations that partner with the Junior League of Savannah to gain volunteers and funding for a specified project. This year, the Junior League of Savannah will select Community Projects that align with the current focus of K-12 Education Performance. To apply, please visit the Junior League of Savannah’s website at www.jrleaguesav.org or call 912-790-1002. The application deadline is December 31, 2018. (SAVANNAH, GA) Help Smash Alzheimers! Take a video of you smashing something (anything), post it to your social media and mention the website, www.SmashAlzheimers.com. This is a fundraiser, so get to smashing! For more information, please contact John Whitwell at jwhitwell2003@yahoo.com. 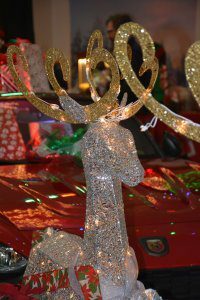 (JASPER COUNTY, SC) Peacock Automotive held the second annual “Santa’s Workshop” Christmas Event. 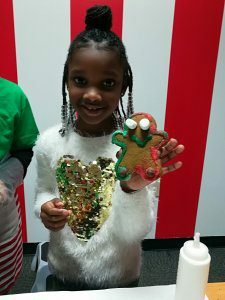 Families enjoyed gingerbread cookie decorating and Christmas caroling with local musician David Ross, as well as a hot chocolate bar and hot dogs. 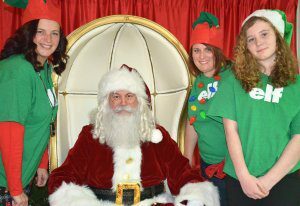 Santa Claus was available for photos. 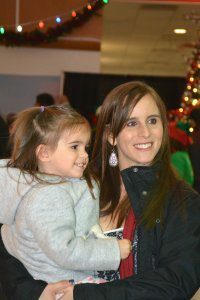 The event was free and open to the public. Also, there was a toy collection drive for the Boys and Girls Club of the Lowcountry, which operates six clubs in Beaufort and Jasper Counties with more than 2,200 members ages six to 18 years. 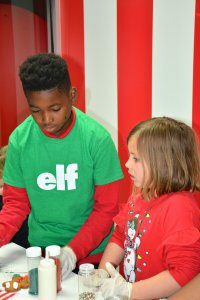 Wish-list items included children’s books, coloring books, toy trucks, building blocks, multicultural dolls, musical toys, play dough sets, large-piece puzzles, pull toys, sports equipment, board games and art supplies, including glue sticks, markers, scissors and stickers. For more information, please visit www.peacockautomall.com or Peacock Auto Mall’s Facebook page at https://www.facebook.com/PeacockAutoMall/. 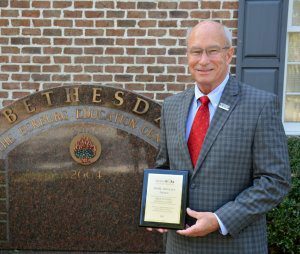 (SAVANNAH, GA) The Georgia GOAL Scholarship Program recently presented Michael Hughes, president of Bethesda Academy in Savannah, with the GOAL Advocacy Award. The award acknowledges individuals who have displayed passion and perseverance when appealing to legislators to preserve, protect and expand the program’s scholarship opportunities. The Georgia GOAL Scholarship Program makes it possible for Georgia taxpayers to redirect a portion of their tax liability each year to receive an equal tax credit on their Georgia tax return. GOAL awards provide partial scholarships to students in 137 participating private schools throughout the state. In May, Gov. Nathan Deal signed House Bill 217 into law, thereby increasing the annual cap on the Georgia Education Expense Credit Program from $58 million to $100 million for the next decade. The signing of HB 217 marked the largest expansion of this program since its inception in 2008. Since 2008, GOAL has awarded 34,482 scholarships worth $128.2 million to 14,340 students, with an additional $28.6 million being obligated and reserved for the funding of multi-year scholarships that have been awarded or for the awarding of future scholarships. The average value of the scholarship awarded to each student has been $3,718, with the balance of tuition costs being paid by scholarship families together with other financial aid provided by the participating private schools. To learn more about the Georgia GOAL Scholarship Program, please visit www.goalscholarship.org. 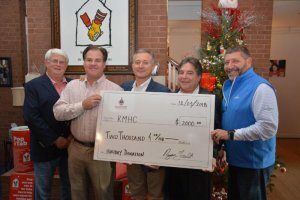 (SAVANNAH, GA) For the fifth consecutive year, Savannah Maritime After Hours presented a holiday donation to the Ronald McDonald House of the Coastal Empire. This year, the donation was increased by $500, for a total of $2,000, which will be used to support the growing needs of the House and their residents. (Left to Right) Larry Hearn (Savannah River Logistics), Ryan Faulk (Savannah River Logistics), Jed Young (Port City Logistics) and Ben Goldberg (JIT Warehousing and Logistics) present $2,000 from the Savannah Maritime After Hours group to Bill Sorochak (far left), Executive Director of the Ronald McDonald House Charities of the Coastal Empire. Maritime community leaders, Ben Goldberg of JIT Warehousing and Logistics, Larry Hearn and Ryan Faulk of Savannah River Logistics, and Jed Young of Port City Logistics presented the check to Bill Sorochak, executive director of the Ronald Mcdonald House of the Coastal Empire. 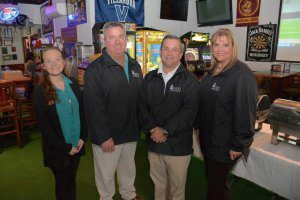 Each year, members of the Savannah Maritime After Hours are able to raise these funds through networking events held on the first Wednesday of each month. For more information on this donation or on how to get your organization added to the recipient list, contact Billy Robinson at billy@portcitylogistics.com. One of 365 Ronald McDonald Houses worldwide, each House is an independent non-profit, 501©3 community organization. The Savannah House is governed by a 16-member board of directors and managed by a full-time staff of four. The mission of Ronald McDonald House Charities© of the Coastal Empire is to create, find and support programs that directly enhance the health and well-being of children and families. The House has thirteen bedrooms and operates on a waiting list most of the year. 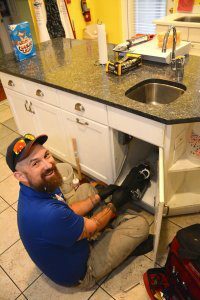 The Savannah Ronald McDonald House provides a “home away from home” for critically ill and injured children and their families who are receiving treatment at Children’s Hospital at Memorial, Candler Hospital, or where needed in the Coastal Empire. Since the House first opened its doors 30 years ago in 1987, over 10,200 families have been served. The house currently serves approximately 290 families each year. Although the average length of stay runs 16 days, some families stay much longer. CEO, Port City Logistics, Inc.
(SAVANNAH, GA) Savannah-based Enmarket announced they will rebuild and expand their current kiosk on Martin Luther King Jr. Boulevard near the Interstate 16 on-ramp to add a state-of-the-art convenience store with numerous features that integrate its appearance into the surrounding historic district. 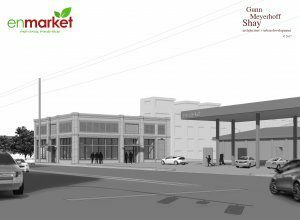 The design of the new 3,522-square-foot convenience store at 405 Martin Luther King Jr. Blvd. will draw from the site’s transportation-related history with its proximity adjacent to the Central of Georgia Railway and Georgia State Railroad Museum. The non-traditional store will include, among other things, an outdoor dining patio, a green space, and a bike service area. Enmarket will contract with a local artist to design and paint a community-themed mural on one of the exterior walls. The rebuilt outlet will be accessible to trolleys and other vehicles critical to Savannah’s downtown tourism industry and will have four multi-product dispensers with gasoline and diesel offering. The new store will feature Enmarket products already available at other full-service stores, including fountain drinks, “chillen” frozen beverages, bean-to-cup coffee, and local craft beer. The location will include Enmarket’s proprietary kitchen concept, The Eatery, featuring its signature breakfast biscuits and antibiotic-free, never-frozen chicken. Fresh grab-and-go sandwiches, salads, parfaits, and more will also be prepared on site. This will be the only convenience store to offer all of these options on the western end of downtown Savannah. When it opens in the spring of 2019, the new store is expected to add about 15 jobs. The current kiosk will close in mid-December for reconstruction. 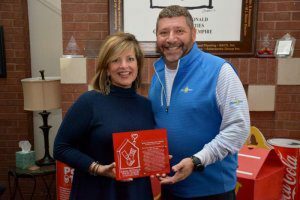 (SAVANNAH, GA) Cecilia Russo Turner of Cecilia Russo Marketing has been recognized as a recipient of the 2018 Community Impact Award by Ronald McDonald House Charities of the Coastal Empire. The community impact awards program began in 2014 to recognize long-time contributors, businesses and volunteers for outstanding achievement in serving local Ronald McDonald House children and families. Turner, who has served as a board member for seven years, has supported the Ronald McDonald House through marketing and fundraising support of various events, including the Chef of the House Challenge, Wine and Fries, The Red Shoe Run and Wine, Women and Shoes. Bill Sorochak, executive director of the Ronald McDonald House, praised Turner for her efforts as a volunteer. The Ronald McDonald House helps families of seriously ill, hospitalized children cope with the stress and expense of daily living while trying to be close and emotionally strong for their children. Ronald McDonald House Charities of the Coastal Empire is a registered 501©3, non-profit that operates solely on donations. The cornerstone program is the Savannah Ronald McDonald House that provides more than 4,170 family night stays each year with a “Home away from home.” Other core programs include the Ronald McDonald Family Rooms in St. Joseph’s/Candler Hospital and Children’s Hospital at Memorial Hospital Medical Center and the Ronald McDonald Care Mobile, a mobile dental clinic providing free dental cleanings and examinations, care to under served, school-aged children in Beaufort County, S.C.
(SAVANNAH, GA) Dr. Jason King, CEO of Live Oak Veterinary Neurology, has launched a new network app called “Heel!” that’s designed to foster cooperation and information sharing between veterinarians and pet owners. The system sends reminders for medication or other recurring needs to pet owners via a smartphone app. An internet portal allows veterinary professionals to communicate with each other and the pet owner on prescription refills, therapy details, and other pet health issues. 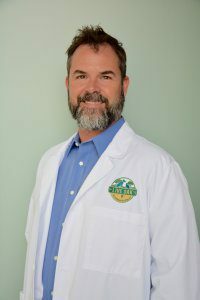 King is the founder and owner of Live Oak Veterinary Neurology in Savannah, which offers veterinary medical and surgical therapy for diseases of the brain, spinal cord, peripheral nerves and muscles. He recently was recognized for his development of the Heel! 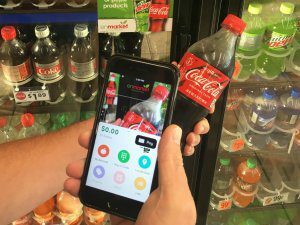 app by the Savannah Chapter of SCORE, the nation’s largest provider of free business mentoring services and educational programs for aspiring entrepreneurs and small business owners. He was selected as a winner of the organization’s inaugural BizPitch Savannah entrepreneurial competition in September 2018. The Heel! app is available for download through online app stores or from the website www.heelapp.com. Jason King is the founder and CEO of Live Oak Veterinary Neurology in Savannah, Ga., and developer of the award-winning “Heel!” veterinary network app. The practice provides medical and surgical therapies for diseases of the brain, spinal cord, peripheral nerves and muscles and offers diagnostic tools and advanced training in electrophysiology and neurosurgery. Dr. King graduated from the University of Georgia in 2006 with a doctorate in veterinary medicine and is one of only 325 board-certified veterinary neurologists in the world. For more information, call 912-662-7544, visit www.liveoakvetneuro.com/ or www.heelapp.com.